Cecil Calvert was still a young man of 26 years when his father Sir George Calvert, Lord Baltimore, died. When his father died, he became the Second Baron of Baltimore. He also inherited the colonies and lands owned by his father. 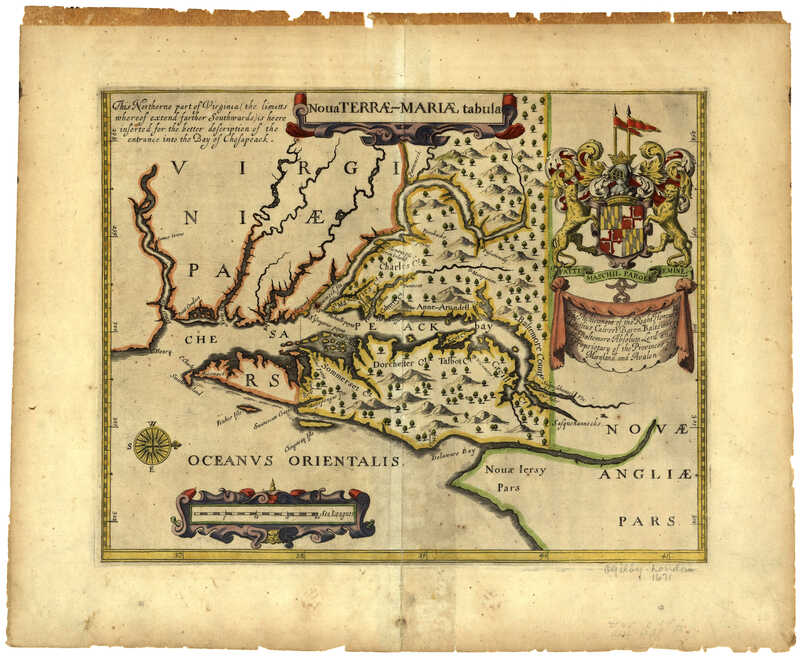 King Charles I approved a request from George Calvert to establish a colony called the Province of Maryland (�Terra Mariae�) in 1635. But the Calvert family received the Charter of Maryland after George Calvert died. Now it was up to Cecil to establish and govern the new colony. Cecil was well educated, but he did not have his father�s years of experience at governing colonies. No one knew what kind of leader Cecil might turn out to be when the King named him Lord Proprietor of Maryland. But Cecil was a wise leader. He invited sons of Catholic and Protestant families to sail to Maryland and establish the new colony. Each of these men brought their wives, children and servants with them to the New World. He wanted to join them in the voyage, but had to stay in England. He was concerned that no one would be able to keep the King�s support for Maryland if he left the country. He sent his brother, Leonard, on the voyage and made him the colony�s first Governor. Before Leonard sailed for Maryland in March 1633, Cecil gave his brother a set of instructions to help him with the colony�s government. This document, called �Instructions to the Colonists by Lord Baltimore,� became the basis of Maryland�s laws 1. Cecil wanted to make certain that Catholics and Protestant were treated fairly under the new system of government. He allowed Catholics to practice their religion. Cecil said that Catholics and Protestants should not be allowed to argue with each other about their beliefs. Cecil was Catholic and knew about the problems that Catholics and Protestants might have in living in the same town. He also advised the colonists about the layout of properties in their first town and about communications with the colonists in Virginia. Cecil governed Maryland from his home in England. He lived with his wife Anne Arundell and their children. Cecil was never able to visit his colony because of the social and political problems in England. The English Parliament had so many disagreements with King Charles I during the seventeenth-century, that they fought a civil war against him (1642-1649). The war influenced events in Maryland since the government of England was divided between those supporting the King and those supporting Parliament. Cecil wanted to make sure the Maryland colony would be protected no matter which side won the civil war. He made friends in Parliament, but he continued to support King Charles I for as long as he could. Meanwhile, a Parliamentary supporter named Richard Ingle attacked St. Mary�s City in 1645. Ingle and his men took many of Maryland�s government and Catholic leaders prisoner. It took Cecil and Leonard Calvert almost one year to take control of Maryland again. But Leonard died in 1647, and the colonists needed a new Governor. In 1648, Cecil commissioned a Protestant named William Stone to go to Maryland as the new Governor. Cecil�s choice of a Protestant was very important to Parliamentary leaders in England. This was Cecil�s way of convincing Parliament that he was loyal. Parliament allowed Cecil to remain the Proprietor of Maryland. On April 2, 1649, Cecil gave Governor Stone a new law to be voted on by the Maryland Assembly. This law is often called the "Act of Toleration," but Cecil�s name for the law was "An Act Concerning Religion." The Assembly put most of the Act of Toleration�s parts into law. 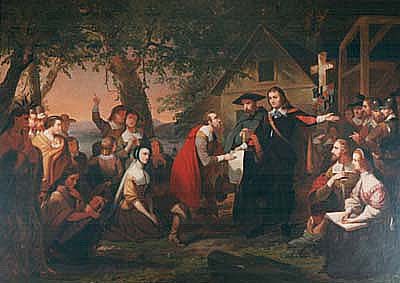 The Act gave colonists freedom to worship any Christian faith, so long as they were loyal to Cecil Calvert and the civil government. But a second civil war in England caused Cecil to loose control of Maryland again. From 1652 to 1655, Puritan Commissioners from the English Parliament fought against Governor Stone and his followers. The Commissioners forced Governor Stone to resign in 1655. This time it took Cecil two years to win back control of Maryland. People in Maryland enjoyed peace in the years following the restoration of Cecil�s title, Lord Proprietor of Maryland. 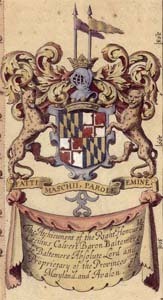 Cecil sent his son, Charles Calvert, to be Maryland�s Governor in 1661. He told his son to keep the Act of Toleration as law for the good of Maryland2. Freedom of religion was important to help the Maryland colonists to live together in peace. Cecil died in 1675, after governing Maryland for forty-two years. 1Cecilius Calvert, "Instructions to the Colonists by Lord Baltimore, (1633)" in Clayton Coleman Hall, ed., Narratives of Early Maryland, 1633-1684 (NY: Charles Scribner's Sons, 1910), 11-23. 2COUNCIL OF MARYLAND (Proceedings), 1671-1675 Archives of Maryland, vol. 15, p. 13. The Charter of Maryland, SPECIAL COLLECTIONS (Huntingfield Corporation Collection) "A Relation of the Successefull beginnings of the Lord Baltemore's Plantation in Mary-land: The Charter of Maryland, 1635." MSA SC 1399-526 also titled: "A Relation of Successfull beginnings of the Lord Baltimore's Plantation in Mary-land," (1635). Click to see a picture of Charles Calvert receiving the Charter of Maryland from King Charles I, by [Edwin] Tunis, King Charles I and Cecil Calvert, charcoal drawing, Tunis Collection, Maryland State Archives. MSA SC1480-1-2. Calvert Coat of Arms, from a map by John Ogilby, Nova Terrae-Mariae tabula, 1671. Huntingfield Collection, Maryland State Archives, MSA SC 1399-1-187. Allegorical Painting: Cecil Calvert Presenting the Acts of Toleration to Gov. William Stone oil painting, 1853, by Tompkins Harrison Matteson (1813-1884), sometimes erroneously entitled: The Founding of Maryland. Painting is located in the Senate Lounge, Maryland State House. MSA SC1545-2551. John D. Krugler, �With Promise of Liberty in Religion: The Catholic Lords Baltimore and Toleration in Seventeenth-Century Maryland, 1634-1692,� in Maryland Historical Magazine vol. 79 (Spring 1984): 21-34.